I’d first read and loved novels by Alan Garner over 20 years ago; Red Shift being a particular favourite. I mentionedthat I’d recently re-read (and thoroughly enjoyed) The Weirdstone of Brisingamen. After some Garner love on Twitter, Aishwarya, suggested that I might like to try some of Alan Garner’s adult fare. So, here we are! Thursbitch is two narratives separated by over two centuries. Jack Turner’s, a jagger (who drives trains of ponies carrying salt across the moors), in 1755 and the contemporary narrative of Sal, a geologist who is struggling with a degenerative disease which is destroying her mind. The novel has an interesting construction: it is like a Möbius strip. It loops back on itself with the end of the novel repeating the events of the start. Thursbitch links the two seemingly disconnected, save the location, stories skilfully. 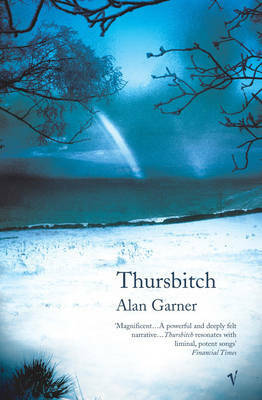 Language – naturally as Alan Garner is noted as a linguist – plays a huge part in the novel. Place does, of course, but more than this, it’s the changes that the characters relationships with the place are undergoing an their views of this. For example, it’s quite useful to know that ‘Sal’ is also a word for salt. Jack Turner’s trade is linked to the contemporary narrative through name. The landscape of Thursbitch (the place) is ancient and, even in Turner’s time, the tracks he follows have existed long before memory. Turner is finding, however that his way of living is under attack. As a shaman of an ancient Celtic bull cult, which is linked almost inextricably with the landscape, the slow death of the ancient religion in the face of Christianity, is changing his and his fellows relationship with the land. Sal’s relationship with the land is different. She is mostly, as a geologist, rational and certainly has a better understanding of the landscape than the 18th century characters do and that, though its movement is slow, it is not perhaps as unchanging as would previously have been believed. She does make one claim in her verbal jousts with Ian, her carer, that the landscape is sentient (although fantastical this is, I think, key to the text). Though Sal realises that the landscape is not unchanging, she still – and more acerbically than Jack perhaps would – bemoans that the use of the landscape is changing; that it is being swamped by strollers and bikers who are besmirching it with their vulgar presence. As befits a novel which is spread over such a (by human terms!) long time, the passage of time and the changes wrought to people and landscape over time are key. The intense and seemingly, to the people at the time, unchanging relationship that they have is explored and the longer view that Garner takes provides the reader with a little perspective. Sal and Jack Turner are linked by their own mortality, the landscape and time. The other thing notable about Thursbitch is the dialogue. In both time periods, the dialogue is a joy to read. Which is fortunate, given that a fair amount of the novel is conducted through dialogue. ‘The land was as level as it could be, for the valley. Then they went past Jenkin Chapel an up towards Pym Chair. At Howlersknowl he left the road he left the road and vibrated across the cattle grid. ‘What are you doing?’ she said. He went to the door and knocked. The door opened and he spoke for a few moments. Then came back. He took her hand to go through the yard to the hillside. ‘I may use them myself,’ he said. They walked along the track between a stone wall and the farm garden. ‘I’m sorry. The moods are the worst part. I don’t necessarily think in the sense of being unnatural dialogue. It’s pleasurable to read and it’s pretty clear that Garner has put as much work into that as he has the chapters set in Jack’s time. More that the relationship between Ian and Sal is, while deep and they share a lot, it’s lacking a certain warmth. There are hints that this is perhaps because they missed the chance for something greater in the past. Interestingly, despite the language used in Jack’s time – though clearly not being incomprehensible – being less familiar to the modern reader I think that the contemporary passages do place more of a barrier between the reader and the characters. Though, as I’ve already mentioned, I don’t believe that this is a problem for the novel. An excellent novel and one which, I am sure, invites and will reward repeat visits. It’s not a novel in which a great deal happens, rather it seeks to examine language time and our relationship with place. Garner’s love of language, place and culture shines through every precisely chosen word. A joy and not to be missed. This entry was posted in Review and tagged alan garner, novel. Bookmark the permalink. Have visited the place after a talk by A G before the book came out. Impressive little valley, with ruin of two farms at the end. There are two large standing stones at the end too; one, allegedly the oldest, has fallen and lies at an angle. The other is still upright. I sat there against it, drank coffee from my thermos, and watched a hare run down from the ruins, and right past me, up Red Moor at the other side. I thought it was a lovely place; but then, I did go on a good day!